In some parts of the world, especially in developing markets, category management today remains a stretch goal – a new idea full of untapped potential. In other areas, the original eight-step process that emerged in the late 1980’s forms the foundation of many companies’ approach to category management. In still others, particularly in developed countries like the U.S., the U.K., and others, refinements are being made – most of them designed to place consumer understanding front and center. New ideas are emerging – from "trip management" to "aisle management" to "customer management." Whether a new descriptor emerges to replace "category management" is yet to be seen. Even if that does happen, what won’t change is the overall objective – to help retailers and their manufacturer partners succeed by offering the right selection of products that are marketed and merchandised based on a complete understanding of the consumers they are committed to serving. This book, which explores both the state of and the state-of-the-art in category management, is for everyone with a vested interest in category management. It can serve such a broad audience because category management is about bringing a structured process to how executives think and make decisions about their businesses, no matter what information and information technology they have access to. ACNielsen, a VNU business, is the world's leading marketing information provider. Offering services in more than 100 coun-tries, the unit provides measurement and analysis of marketplace dynamics and consumer attitudes and behavior. JOHN KAROLESKI is Editor of an e-magazine called CPGmatters.com. It covers in-store marketing and category management. He is the coauthor of two books, Target 2000: The Rising Tide of TechnoMarketing and All About Sampling. He was formerly senior editor of Supermarket News and editor in chief of Brand Marketing. AL HELLER, President of Dis-tinct Communications, LLC, is the author of numerous consumer packaged goods industry studies and three books. He was formerly editor in chief of Nonfoods Merchandising and Supermarket HQ Quarterly, and executive editor of Drug Store News. Chapter 0: Introduction—Why Category Management Is More Important Than Ever. PART I: IN THE BEGINNING—THE PURPOSE OF CATEGORY MANAGEMENT. Chapter 1: The Evolution of Category Management and the New State of the Art. Chapter 2: Category Management Begins with the Retailer’s Strategy. PART II: THE EIGHT FOUNDATIONAL STEPS OF CATEGORY MANAGEMENT. Chapter 3: Step One: Define the Category Based on the Needs of Your Target Market. Chapter 4: Step Two: Assign a Role to the Category That Best Supports the Retailer’s Strategy. Chapter 5: Step Three: Assess the Category to Find Opportunities for Improvement. Chapter 6: Step Four: Set Performance Targets and Measure Progress with a Category Scorecard. Chapter 7: Step Five: Create a Marketing Strategy for the Category. Chapter 8: Step Six: Choose Tactics for Category Assortment, Pricing, Promotion, Merchandising, and Supply Chain Management. Chapter 9: Step Seven: Roll Out the Plan. Chapter 10: Step Eight: Review the Category’s Performance Regularly and Make Adjustments as Needed. Chapter 11: Bringing the Consumer into Category Management—A New Take on the Eight Steps. PART: III: CATEGORY MANAGEMENT SUCCESS STORIES. Chapter 12: General Mills—Going Beyond the Categories. Chapter 13: Big Y—Focusing on Implementation. Chapter 14: SUPERVALU—The Last Three Feet of Category Management. Chapter 15: CROSSMARK—Just the Facts. Chapter 16: Acosta—Multiplying the Impact of Category Management. Chapter 17: Chiquita—Extending Category Management to Perishables. Chapter 18: The Hershey Company—Linking Consumer Insights and Customer Strategy. Chapter 19: Miller Brewing—Tapping Category Management for Competitive Advantage. Chapter 20: Hewlett-Packard—Taking Category Management beyond Traditional CPG. PART IV: THE WAY FORWARD. Chapter 21: Lessons Learned from the Real World. Chapter 22: Proactive Category Management (Shan Kumar). Chapter 23: Linking Category Management and Loyalty Marketing (Glenn Hausfater). 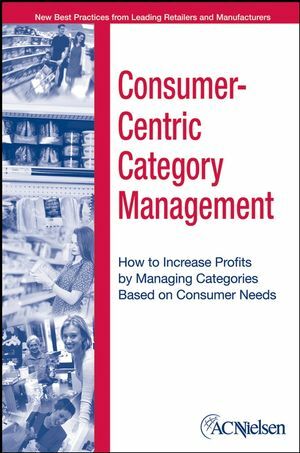 Chapter 24: The New Category Management Emerges (Dirk Seifert).